Apilak – Royal Jelly 25tbl. Home/Food supplements/Preparation/Natural Tablets/Apilak – Royal Jelly 25tbl. Nutritious Royal Jelly is a natural bee product that contains essential amino acids, a wide range of trace elements: iron, zinc, manganese, essential for blood formation, has beneficial effects on the bone marrow, a positive effect on the quality of red blood cells and also the amount of hemoglobin. Effect: biogenic stimulator, anti-sclerotic, radio-protector, proteolytic, bactericidal, bacteriostatic effect. 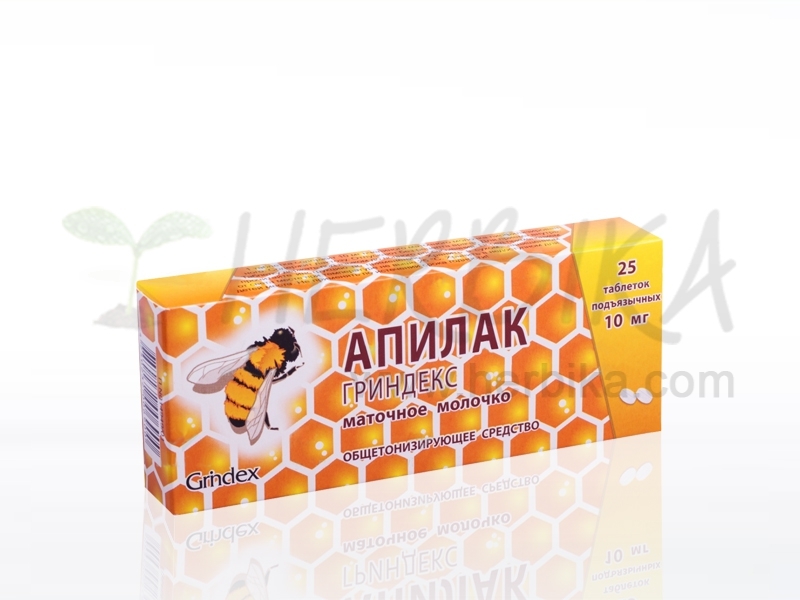 Ingredients: Royal Jelly 10mg, lactose, potato starch (fillers), calcium stearate, in one tablet. Recommended dosage: Adults and children over 15 years: 1 tablet 3 times a day. Children 3-15 years: 1 tablet 2 times a day. Recommended duration of use: 10-15 days.